So I disappeared from the blog world for 5 weeks and spent my time working, working out and spending time with friends. Nothing super exciting happened, but I enjoyed the time not having to put everything into words that just seemed routine. My workouts have definitely gotten more intense in the last 5 weeks, especially in the running department. 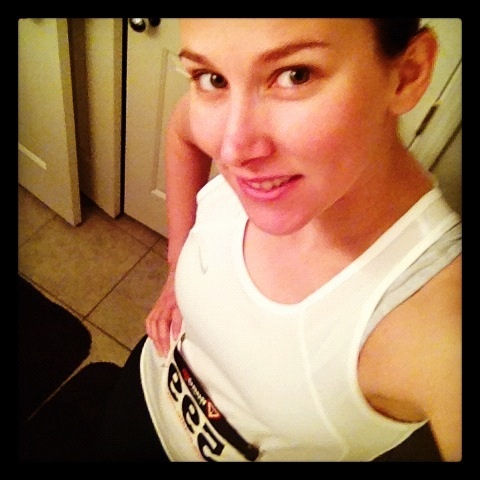 Tina put together a great plan to help me get faster after my first 5k. I really would have been lost without her. I was still running 3 days a week, but two of the runs were interval and tempo runs with one easy run. Plus I was doing 3 different strength training workouts and a cross training cardio workout. I’ve really began to revolve my life around my workouts. I’m enjoying the change in my priorities and the change in my body. I had been thinking about signing up for a 2nd 5k since I finished the first one. I guess you can say I’m a little bit addicted to running. I had been eyeing a 5k that a church/private christian school was putting on not too far my apartment. I figured it would be a small scale, fun event. Since my bff was out of town, I ran it solo. I probably could have convinced someone else to run it with me but decided to just go for it alone. I woke up early (which I pretty much do every day now, who am i??) on Saturday, had a little snack and some water, got dressed and headed over to the event. I was pretty early since I didn’t want to be late and was unsure of the parking situation. Thankfully I run with my iphone so I had some entertainment until the race started. Don’t worry I also stretched and warmed up. My goal for this race was 35 minutes, but I knew I would be faster, one of my runs the week before was 34:51. I just wanted to get a good pace and go for it. It was hot, it was going to be in the 90s later in the day and was in the upper 70s by the time the race started. My garmin was off on the distance, so I thought I was running around 11:15 miles, but apparently I was going faster. There were a lot of families running so kids were darting in front of me pretty much the entire time. For the last mile, there was a run/walker who was kind of driving me crazy. The heat definitely bothered me, there were a few times I thought about throwing up, but kept it in check. Since I trained without water, I didn’t want to stop for any along the way. I will say this race had 3 or 4 water check points, I was pretty surprised since it was only a 5k, but with the heat and all the kids it was probably a good idea. By the time I hit the finish line I was extremely surprised when my time was 32:30 (my first 5k time was 38:04)!!! I couldn’t believe it and thought someone miscalculated the distance, until I went on my computer and used map my run and saw it was right on. I can’t believe I cut my time by over 5 min 30 sec in ONLY 5 weeks! I really attribute it to all my hard work and Tina’s training plan. I killed it on this race and I couldn’t be happier! 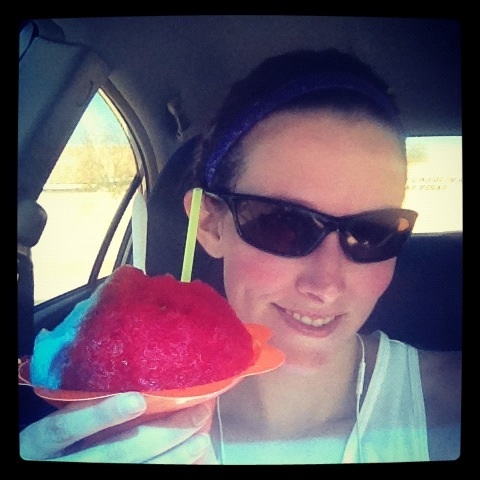 To celebrate my race I was pretty excited to see my fav food truck, Snow Ono Shave Ice, parked at the church, so of course that was my first stop after grabbing a bottle of water. Up next for me I will be running a 5k obstacle course through Animal Kingdom in Disney World on a team with my mom. Followed a week later by the Devil Dash, which is a 5k mud run/obstacle course. I’m really excited for the race through Disney World! I wouldn’t say I’m excited for Devil Dash, but I’m up to try it and see if I survive. Thanks Maria! I actually just bought water bottle with the hand strap because I know I have to start drinking water or gatorade while I run. 10 miles by September? You’re much farther along than me! That should be so fun! Good for you amy!! way to go! Plus – an obstacle at Animal Kingdom? How freakin’ awesome is that! keep up the good work! Thanks Caryn! I’m so excited for the obstacle course in Animal Kingdom! I think a disney run is something everyone has to try. Congrats on killing your 5k time! Sounds like you had a great race. Good luck with your training for your upcoming races. Thanks Amy! I’m little nervous for the mud run!